Status: Ordained minister of the Methodist Church in Samoa since 2013. Lecturer in Piula since 2013 until present. Masters of Theology (Pacific Theological College, Suva 2012). * Contextual Theology in Oceania. “E le iloa le alu e laki” in Le Faasoa: Pacific Church History, Ministry, Theology and Biblical Hermeneutics, M. Mailo (Eds.) 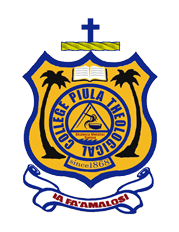 Piula Theological College, 2017.